Barclays is to become the Women's Super League first ever title sponsor, in a deal the Football Association has called "the biggest ever investment in UK women's sport by a brand". The competition will be rebranded the Barclays FA Women's Super League and include a prize-money pot of £500,000. "It's a real landmark moment in the development of the women's game," the FA's director of the women's professional game Kelly Simmons told BBC Sport. "We obviously want to get more fans and more revenue behind the game, making sure it's secure and sustainable for the future. "But also the investment in schools makes sure lots of girls get the chance to play football, which is our pipeline for the future." Former Arsenal and England striker Kelly Smith felt the deal was "long needed" for the women's game. "It's massive, massive news," said Smith, who retired in 2017 after a 13-year career. "Even when I was playing, I was hoping a big brand would come on board and help promote and develop the women's game. "It's in such a healthy place now and you can see the interest growing year-by-year. "If England can do well at the World Cup and get to the final or even win it, the game will be taken to a new level. It's a healthy place to be." Barclays' sponsorship deal will see them become the lead partner of the FA Girls' Football School Partnerships, a nationwide scheme to help develop girls' access to football at school. The partnerships aim to double participation and fan base in the game through the FA's Gameplan for Growth strategy, a four-year plan launched in 2017. "We'll create 100 girls football schools partnerships across the country, involving around 6,000 schools, making sure girls have opportunities to play right from a young age," Simmons said. The WSL began in 2011 initially as an eight-team, semi-professional breakaway division. It is now Europe's only full-time strictly professional competition with 11 teams. Last summer's restructuring of the English women's leagues saw the second tier renamed as the Women's Championship, with Manchester United the only current full-time side. A 2017 study by BBC Sport found that the biggest disparities in prize money were found in football, cricket and golf. But news of the Barclays deal follows other big announcements in women's football. The winners of this year's Women's World Cup will see prize money doubled to $4m (£3.1m). The overall prize fund will increase from $15m to $30m, which is split between the 24 teams taking part at the tournament in France. That total amount is still less than the $40m increase that men's World Cup prize money will see in 2022 - for a total of $440m in prize money. Adidas also recently confirmed that all of its athletes on the winning Women's World Cup team would receive the same performance bonuses as their male counterparts. Overall, female footballers' wages still lag behind. 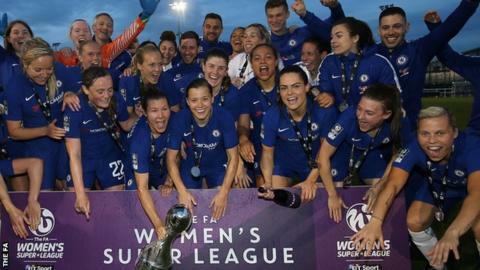 In the top seven women's leagues, 1,693 players earned combined club salaries of £32.8m a year in 2017, according to a Sporting Intelligence report. Uefa says that there are about 1,800 professional female footballers registered in Europe. Women's football is catching up in terms of sponsorship. Visa recently signed a seven-year deal with Uefa to sponsor women's football. It became the main partner of the Women's Champions League and European Championships. Lucozade Sport has also recently signed its first sponsorship in women's football with the England Lionesses. They've sponsored the men's senior team since 2008. Sponsorship is generally higher in men's sports, given that it features more prominently on television.